This Pesach, I had the privilege to travel to Belarus with HUC-JIR to support Jewish communities in their celebrations of Pesach. I had hoped to write regularly about my experiences there, however the country remains politcally oppressive in many ways, particularly when it comes to freedom of speech and criticism of the State. As a result, I was considerably cautious in what I posted online – not wanting to jeopardize myself or the communities that I was working with. Over the next few days, this will instead be something of a retrospective of my time there. I’ll have much to say about the experiences we had in individual communities across the country throughout Pesach – I’ll update each of them in their own post. 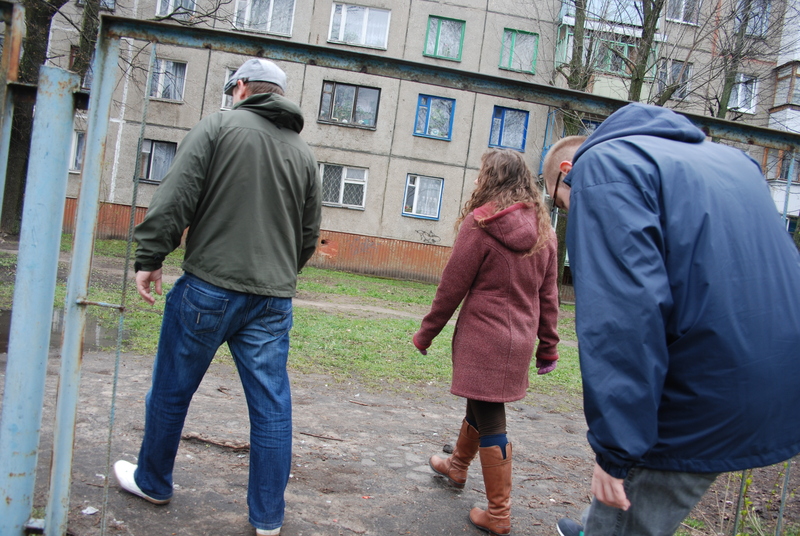 For now, I’ll begin with some observations from my initial encounters with the people and places of Belarus. Belarus is a difficult country to describe. As I walked the streets of its cities, towns, and villages, I often felt as though I was traveling backwards through time and space. The country is not so much a confluence of East and West, as is Israel. Rather, Belarus appears to be a country that confronts a confluence of the worlds outside of and the inside of its borders; wanting desperately to reap the benefits of the wider modern world, yet exerting extreme pressure to keep its citizens in a very specific place. 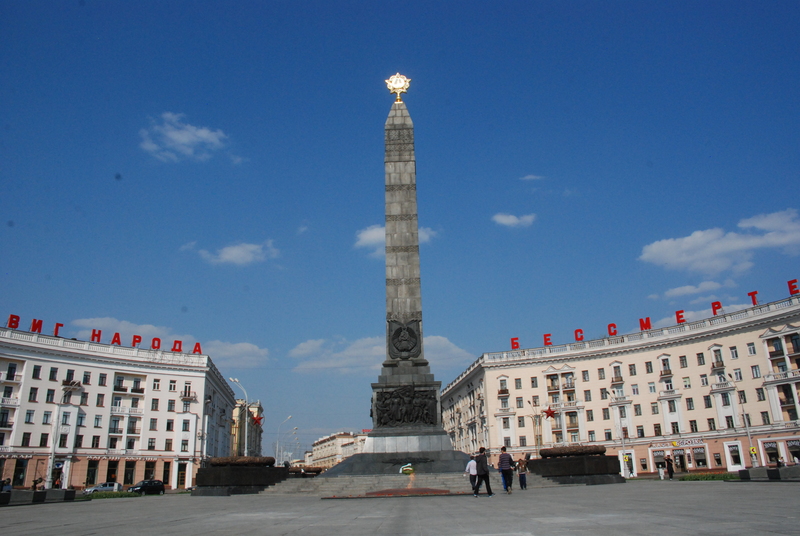 Belarus is the last Soviet country remaining in the world. One president has presided over the country for two decades, changing the rules of democratic voting to suit his own needs. Oligarchs rule the country, and there is little question of the imposing power of socialism that still grasps the land. Yet the Adidas and Levis stores are footholds of American-style capitalism, and the iPhones in the hands of its youth are a sign of the relative freedom of access to international media. This is certainly not Turkey, with its shuttering of Twitter and clamping down on the internet. Yet criticizing the government in the press is a criminal offense, and while freedom of speech exists, it is clearly limited. When speaking about the government, people either proudly proclaim their love of “our father, the president,” or speak in hushed tones, looking over their shoulders to see who might be listening. Landing at the airport, anyone of us would be forgiven for thinking that we had stepped back in time to the 1960s U.S.S.R. We were given immigration papers that we were required to have every hotel stamp, in order to track where we were traveling within the country. We were informed that each community we visited was required to verify that we had spent time with them, and indicate what we were doing there. Stepping out of the airport into the pouring rain, I was once again confronted with the clichéd image of Eastern Europe as a cold, grey, landscape. In some places, Minsk feels like a cosmopolitan city, with streets lined with cafes and boutiques. But then you gaze upwards and see the imposing, brutalist architecture; the looming presence of Lenin, immortalized in iron statues on corner after corner after corner; the hammer and sickle emblazoned on red stars high over head. The KGB (yes, it still exists) occupies a fortress on the main thoroughfare. While it is certainly a beautiful city, its beauty is propaganda, a tool designed in an almost sinister way to ensnare the minds and hearts of those who walk its wide streets. On our train ride from the metropolis of Minsk through the countryside to the city of Babruysk, we asked Arseni about the role of music in the country. “Yes, we have a lot of talent,” he told us. “Maybe it comes from not being allowed to express ourselves publicly. This builds up inside us and comes out in music.” I was struck with a powerful blow by the eerie poetry of his words. Sitting in the suffocating train car, I immediately felt a profound sense of confinement; wanting to get up and express some iota of freedom, even if only by walking around. An odd feeling to have, given that were were in the country specifically to celebrate the freedom of Pesach. 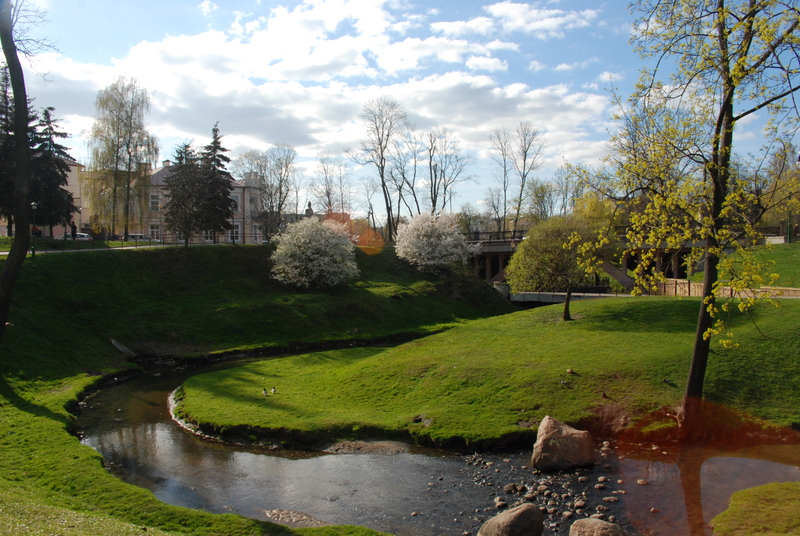 While Babruysk and its sidewalk-less streets was a challenging city to navigate, our next destination – the picturesque town of Grodno – could easily be mistaken for any old European city, complete with cobblestone pedestrian walkways, pristine buildings, and inviting parks along the river. It is stunningly beautiful, spared from destruction by the Nazis “thanks” to their swift conquering of the region. But much of this beauty is superficial: one night, after leaving the darkness of a cellar pub, I learned that walking on the grass in Grodno is prohibited, a punishable offense. Enter said pubs, and you learn that foreigners are often viewed with suspicion – leered at and seen as prime targets for scamming and cheating. 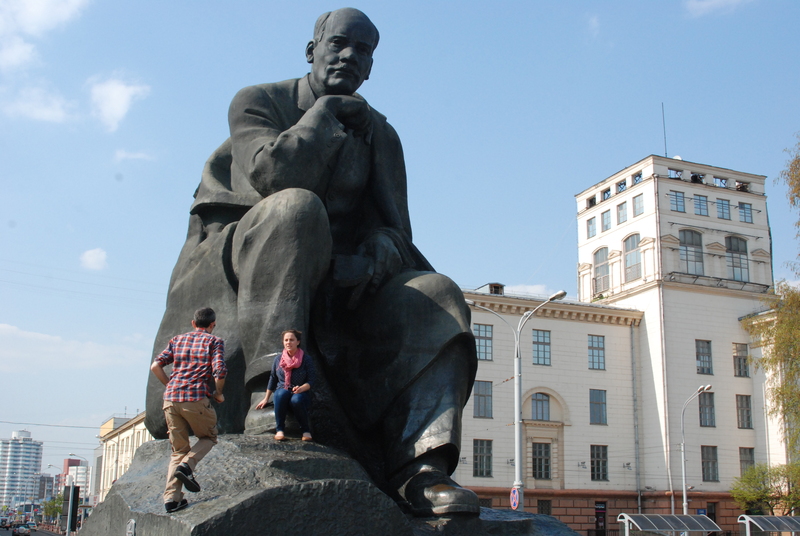 Belarus – the difficult country to describe – was also a difficult country to spend time in. As challenging as it was, our time with the Jewish community there was still a resounding success. It was astounding to observe the differences from our visit to Lithuania the week before. Lithuania – a modern, advanced country and member of the EU – has a comparatively minuscule (yet incredibly optimistic) Jewish community. I was fascinated by this sociological paradox. Stephanie poignantly remarked to me, “even when we’re on the right side of history, we’re on the wrong side of history.” Fortunately, our time in Belarus was a clear indication of how the Jewish community there has emerged on the right side of history. In more places than we were able to visit, over 1,500 Jews celebrated Pesach with Belarus’ Progressive Jewish communities. Over the next few days, I’ll share more thoughts on our experiences in the communities we visited. For now, as I stare out the window on our flight home to Israel and I count down the minutes until I will again be surrounded by the sounds of Hebrew (as abrasive as they may be at the airport), I am profoundly thankful to have had these experiences in the country that gave birth to my great grandfather. A week ago, 2,400 kilometers from where I normally spend Shabbat these days, I found myself in Krakow’s progressive shul for Kabbalat Shabbat. I was spending the week in the Czech Republic and Poland as part of my training to be an Educator/Tour Guide this summer, and had just spent the entire day at Auschwitz and Birkenau. Needless to say, the arrival of Shabbat was a welcome respite from the downtrodden atmosphere of the morning and afternoon. Beit Krakow meets in the Galicia Jewish Museum, which houses a collection of stunning photos of Krakow’s Jewish past and present. Singing the psalms of Kabbalat Shabbat, we were surrounded by pictures of the former glory of this city, and of the destruction that took place there. On Shabbat last week, as I prayed, surrounded by members of the Krakow Jewish community, mere steps away from where the mass genocide of Jews once took place, the image of Poland as a sad, grey place was further pushed from my mind. As the rabbi chanted Shema and arrived at the paragraph about tzitzit, she walked over to a young boy – maybe two years old – who was sitting on his mother’s lap. She handed him her tzitzit. He gathered them in his hands, brought them up to his lips, and kissed the fringes. Having spent a considerable amount of time at Auschwitz, at Birkenau, at Terezin; seeing the remains of Judaism in Europe, I don’t minimize the importance of remembering the dark, grey history of our past there. 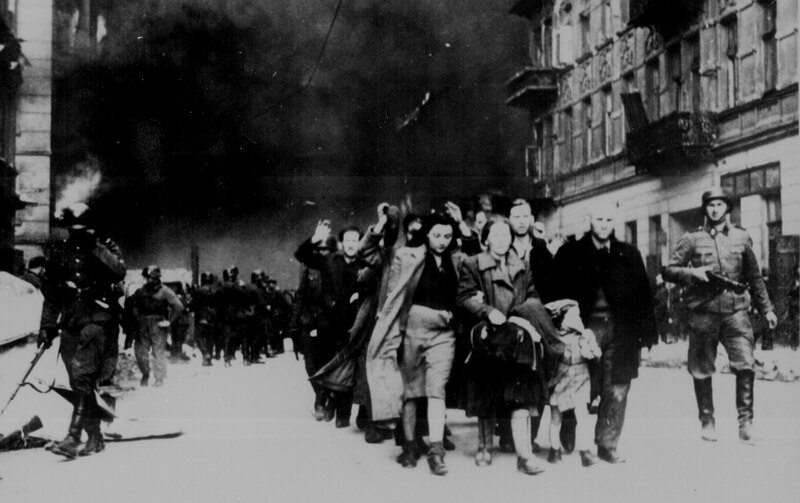 But I don’t believe that memory of the Holocaust needs to be based solely on a dark, melancholy view of the past. We must also look to the present and the future. Survivalism is not a compelling framework for Judaism – we have to offer meaning in the here and now. Young Jews should travel to Poland to see the death camps. But they should also see the Jews who bring their children to shul on Friday night. 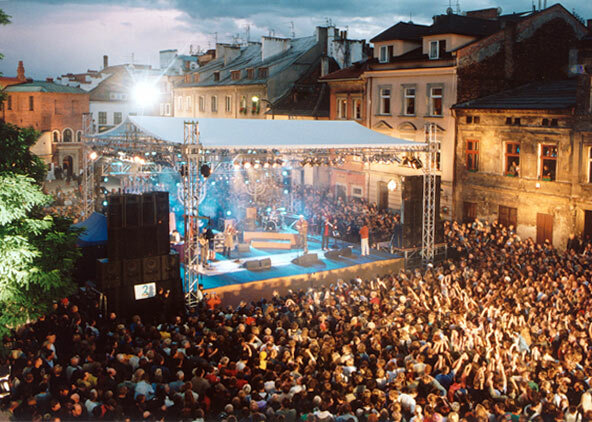 The should see Krakow’s Jewish Cultural Festival. They should see the JCC there, with its young, new rabbi. Doing this, it becomes more difficult to keep that grainy, grey image in our head. And that’s a good thing. If we’re going to have an identity based on the Holocaust, it should be one where at the end, we get to rejoice and shout out for all to hear… They tried to end us. But we f*cking won!